The Experimental Music Technologies Lab at Sussex will have a strong presence at this year’s NIME (New Interfaces for Musical Expression Conference) which is held by Aalborg University in Copenhagen, Denmark. 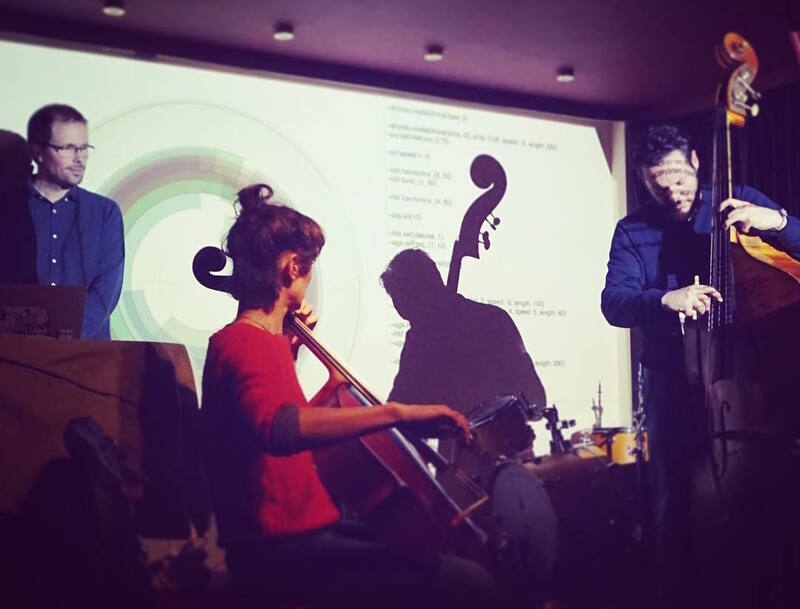 Cecile Chevalier and Andrew Duff present a sound installation, Alice Eldridge and Chris Kiefer will present a paper on their Feedback Cello project, Thor Magnusson will present his paper on Musical Organics, and Alice, Chris and Thor will perform using the Threnoscope and feedback cellos. Alice Eldridge and Chris Kiefer present a paper introducing their feedback cello project, which is a new electroacoustic actuated instrument in which feedback can be induced independently on each string. Built from retro-fitted acoustic cellos, the signals from electromagnetic pickups sitting under each string are passed to a speaker built into the back of the instrument and a transducer on the front of the instrument. Placement of acoustic and mechanical actuators on the resonant body of the cello, mean that this simple analogue feedback system is capable of a wide range of complex self-resonating behaviours. 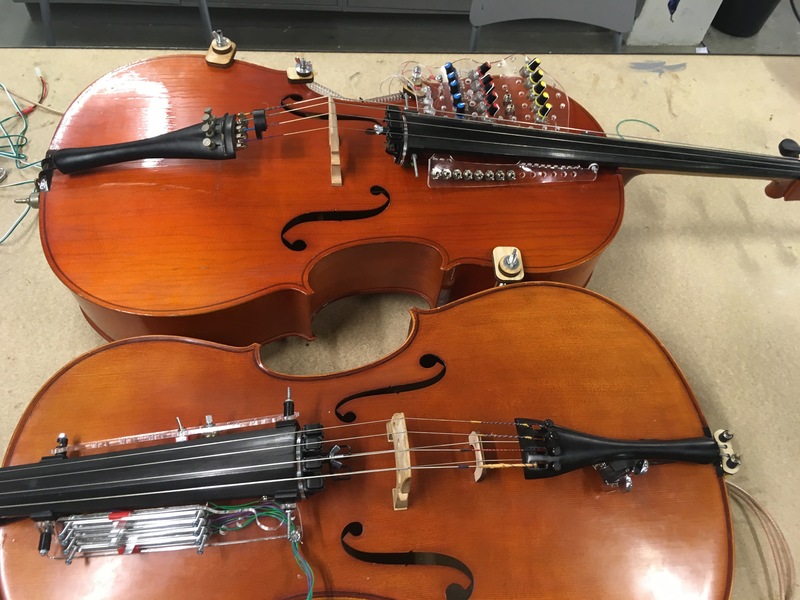 Their paper describes the motivations for building these instruments as both a physical extension to live computer music practice and an electroacoustic augmentation of cello. The design and physical construction is outlined, and modes of performance described with reference to the first six months of performances and installations. Future developments and planned investigations are described. Cecile Chevalier and Andrew Duff’s 200.104.200.2* is a sound installation, created as a displaced reenactment of both contemporary digital social practice and the Internet as a memory palace, in which sonifications of memory traces can be performed, stored and replayed as digital data. The work is situated in relation to the art of memory as a form of memory spatialisation, and in relation to post-digital aesthetics, ultimately forming a potential immersive instrument for collective performances. In its conceptual design and instrument-making, 200.104.200.2 is a stainless steel structure 2.5 meters high, 2 meters long and 2 meters wide, from which over 3000 copper wires hang. 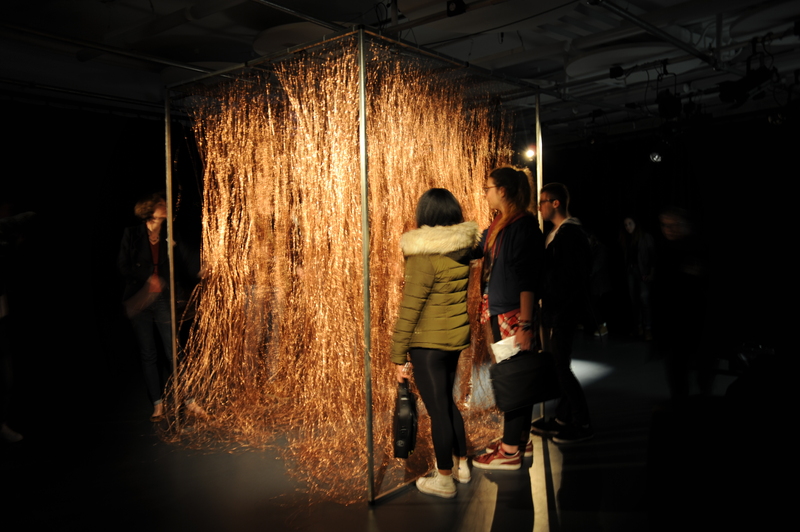 The structure itself can be entered by participants or performers, as it tracks, connects and extends each of their movements through fine colliding wires that occur within the piece. Thor Magnusson’s Threnoscope and the Feedback Cello project of Chris Kiefer and Alice Eldridge meet for the first time in a performance at NIME. The feedback cellos are built from acoustic instruments that are modified with electromagnetic pick ups, speakers and transducers, to create a self-resonating drone instrument which can be played either within the extended string tradition or live coded. The threnoscope is a software instrument designed for spatialised, microtonal drone music. In this performance, six channel outputs of the Threnoscope are diffused through a quadrophonic system and also sent to the speakers in the two cellos, affecting the resonant landscapes of the instruments which are simultaneously played by Alice and Chris. Acoustic signals from the cellos are also channeled back to the Threnoscope, creating a multi-instrument, multichannel feedback system. Sonic processes which are physically or digitally initiated by the players on discrete instruments influence each other to form a single dynamical drone system; the liveliness of the ensemble-system as a whole outperforms any one of the players. New digital musical instruments are difficult for organologists to deal with due to their heterogeneous origins, cross-disciplinary science, and fluid, open-ended nature. NIMEs are studied from a range of disciplines, such as musicology, engineering, human-computer interaction, psychology, design, and performance studies. Attempts to continue traditional organology classifications for electronic and digital instruments have been made, but with adverse results. This paper discusses the problem of the tree-like classifications of digital instruments, proposing an alternative approach: musical organics. Musical organics is a philosophical approach to the problems inherent in organological classification of digital instruments. Shifting the emphasis from hand-coded classification to information retrieval supported search and clustering, we propose an open and distributed system that anyone can contribute to. In order to show how such a system could incorporate a third-party addition, the paper also presents an organological ontogenesis of three new musical instruments: the saxophone, the Minimoog, and the Reactable. This micro-analysis of innovation in the field of musical instruments can help forming a framework for the study of how instruments are adopted in musical culture. Thanks to the School of Media, Film and Music and the Sussex Humanities Lab for the support.